The Diaper Dawgs Spray Collar is now available at Green Team retailers everywhere. 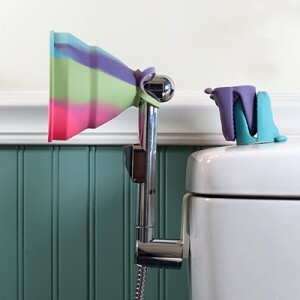 This unique cloth diaper over-spray shield fits in the palm of your hand, does not require reassembly, and doesn’t touch any part of the toilet or water! 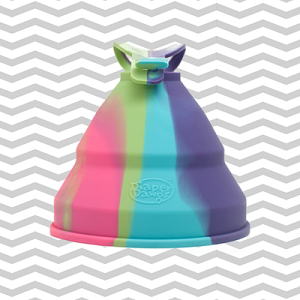 The Diaper Dawgs Spray Collar collapses, making it perfectly portable for travel, and it fits on the top diaper sprayer brands. One of the biggest complaints from those who use or are thinking of using a diaper sprayer is that it makes a mess. Water over-spray gets on the toilet and has the potential to get other places if you’re not careful. That’s where the Diaper Dawgs Spray Collar comes in! The Spray Collar allows you to spray your soiled diaper at close range or at a bit of a distance without making a mess. It’s easy to use, fits most cloth diaper sprayers on the market and is super affordable and durable! For a video demonstration of the Spray Collar check out the YouTube video below. Join Green Team today to order the Diaper Dawgs Spray Collar wholesale. This entry was posted in Blog and tagged cloth diaper accessory, Diaper Dawgs, new products, spray collar. Bookmark the permalink.